an instrument of introduction and query very useful that you should not miss in the library of any sociologist or a Sociology student. This Dictionary, whose first edition was published in 1998, has already become the basic work of reference in the field of the sociology of hispanic. It has been advised of the publication of this new edition, revised, considerably enlarged and updated. The continuous expansion of the social sciences, their role as professional knowledge for social engineering, social policy and educational policies of the government and the public and private actions is reflected in numerous new terminology, so that the publishers have introduced or expanded those terms of greater weight and force. On the other hand, are added to this edition, forty-three new partners, including prominent social scientists, Latin american, and accommodates well to the hispanic community more broadly. […] we are in the best Dictionary of Sociology ever written by Spanish authors, or that it is a work that competes with advantage with the best of its genre written in other languages, or that it is an instrument of introduction and query very useful that you should not miss in the library of any sociologist or a Sociology student. 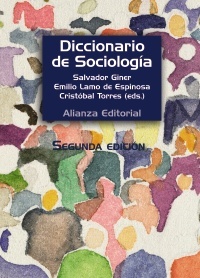 […] I think that Salvador Giner, Emilio Lamo de Espinosa and Cristóbal Torres have done a task outstanding editing this Dictionary of Sociology, whose unequal average content I in a remarkable high. I think that deserves to be a success and that a good way of giving thanks to the editors would be that everyone, readers and authors, assist them to improve it in successive editions. Salvador Giner was born in Barcelona on the 10 of February, 1934. Bachelor’s degree in Law from the University of Barcelona in 1957. Performed post-graduate studies at the University of Cologne. Bachelor’s degree in Sociology (1964) at the University of Chicago. Is Doctor of Philosophy (Sociology) from the same University in 1969, and by the Autònoma of Barcelona in 1976. 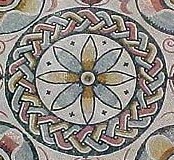 It develops an extensive teaching work. Serves as a full professor and holds the headship of the Department of Sociology of the University of Barcelona from 1987 to 1991. Before he had been a visiting professor at Yale University (1980-81) and at the King’s college of Cambridge (1964-65). He has been a professor of the university of Puerto Rico, Reading, Lancaster and Brunel West London (as Professor of Anthropology and Sociology) in the years between 1979 to 1987; and as a visiting professor at the Universities of Rome and Mexico in 1994, and Valencia (Venezuela) in 2001. From 1990 to 1996 serves as associate professor of the Pompeu i Fabra University and in this same university runs (1996 to 1998) the postgraduate course “Social Theory Modern”. Since 2005, he is professor emeritus of the University of Barcelona. He is a founding member in 1979 and president of the Catalan Association of Sociology. Chaired from 1987 to 1991, the Federation of Associations of Sociology of the Spanish State. Member of the Executive Committee of the International Association of Sociology from 1983 to 1990. Organizes the World Congress of Sociology, 1990, in Madrid. He is a member of the Scientific Committee of the European Congress of Social Sciences of the U. E. since 2001. He is director of the Institute for Advanced Social Studies, of which he is founder, from 1988 to 1999. 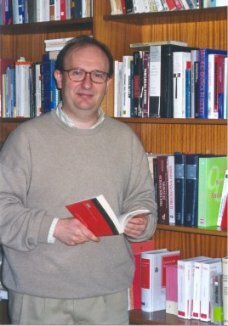 He currently chairs the Institute of Catalan Studies since the year 2005. He has been editor of the International Journal of Sociology (1991-2004) and has collaborated in other as a member of editorial boards (Sociology, International Sociology, European Journal of Social Theory, The Deer, the Journal Classical Sociology). The University of Valencia (Venezuela) he distinguished as Doctor honoris causa in 2005. And the Generalitat de Catalunya presented with the Creu de Sant Jordi in 1995. Emilio Lamo de Espinosa is the President of the Elcano Royal Institute since 28 march 2012. Is Doctor in Law by the Complutense University and Phd in Sociology from the University of California-Santa Barbara, where he extended his studies from 1972 to 1975. 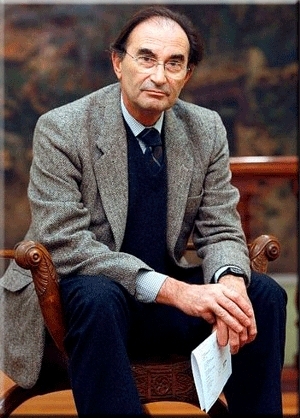 On his return to Spain he won the oppositions, first of Professor, and then Professor of Sociology at the Complutense University (1982). He has been Visiting Professor of Sociology at the University of California-San Diego and has taught at numerous Spanish and foreign universities. In 1982 he was appointed Director-General of Universities and then the first Secretary General of the Council of Universities, assuming the responsibility for the elaboration of the University Reform Law (1983). In 1992, and in the framework of the EXPO, initiated the research on the image of Spain abroad under the label “the Gaze of The Other”, a task that has continued since then in many countries (Italy, Germany, France, England, USA, Japan and others). He was director of the Instituto Universitario Ortega y Gasset (1992-2001), and the founder and first director of the Elcano Royal Institute (2001-2005). He has also been President of the Spanish Federation of Sociology (2007-2009), of which he is currently Honorary Member, and member of the Research Committee of the European University Institute (European University of Florence). Currently, he is Academic of Number of Real Academy of Moral and Political Sciences (medal 44), a member of the European Academy of Sciences and Arts, Vice president of the Foundation Council Spain-Usa, and a trustee or director of numerous foundations (Fundación Ortega-Marañón, Fundación Real Instituto Elcano, Fundación Botín, Fundación Príncipe de Girona, Fundación Spanish Transition, Fundación Fernando Pombo, and the Fundación ICO). He has published twenty-two books, more than a hundred scientific monographs and almost 400 articles, press release or disclosure. He won in 1996 the International Award for Essay Jovellanos for his book, Societies of culture and societies of science (Ediciones Nobel, 1996), and is editor (together with S. Giner and C. Torres) Dictionary of Sociology’s most widely used Spanish language (Alianza Editorial, Madrid). His latest book, as the coordinator, it is Europe after Europe (Madrid, 2010). Has recognized six sexenios researchers. He has directed fourteen doctoral dissertations and four of them received the Extraordinary Prize of Doctorate. He is Doctor Honoris Causa by the University of Salamanca (2012). Cristobal Torres is full Professor in the Department of Sociology of the Autonomous University of Madrid and Academic Secretary of the same. Is also a Doctor in Political Sciences and Sociology by the Complutense University of Madrid. He has taught regular courses or lectures in the Complutense University of madrid, University of Barcelona, University of Valencia, University of Alicante, University of the Basque Country, Universidad Internacional Menéndez Pelayo (Santander), Universidad de Salamanca, University of Oviedo, the Public University of Navarra, Universidad de Cádiz, Institute for Advanced Social Studies and Institute of Public Policy and Public Goods (CSIC), Universidad Veracruzana (Mexico), National University of Quilmes (Argentina), Autonomous University of Baja California (Mexico), National Autonomous university of Mexico, National Polytechnic Institute of Mexico, London South Bank University, Université ParisDauphine (Paris IX), University of Lisbon, as well as in a large number of other public and private institutions. His areas of intellectual work and empirical research are the sociology of science and technology, the methodology of the social sciences, sociological theory, sociology of public opinion, the sociology of education and the issues of training and labour market. In these fields he has carried out empirical research for the European Union (evaluative research of the programmes of the ESF), the Spanish Administration, various Foundations and other public and private entities. For five years he has co-edited, with professor Felipe Saez, the Observatory Occupational of the Autonomous University of Madrid, pioneer in Spain of this type of initiatives devoted to the evaluation of the labour insertion of the university. He is the author of more than fifty articles, chapters in books (published in the leading journals and publishers in sociology and social sciences, Spanish) and working papers, as well as eight books, or publications. Among these latter it should be noted, Political Sociology of Science (CIS-Siglo XXI, 1994); Sociology of Knowledge and Science, in co-authorship with the professors Emilio Lamo de Espinosa and José Mª González (Alianza Universidad, 1994); Continuous Training in Spanish Companies and the Role of the University, in collaboration with professor Martí Parellada, Felipe Sáez and Esteve Sanromá, (Civitas, 1999); Anuario Social de España 2000 and following (La Caixa, 2000 and following); IOPCIS 19632003 (CIS, 2004), as well as is editor, along with the teachers Salvador Giner and Emilio Lamo de Espinosa, the Dictionary of Sociology (Alianza Editorial, Madrid, 1998, 2006). He has done research stays researchers at the London School of Economics and Political Sciences, University College (London), the University of Michigan (Ann Arbor) and the University of San Diego, California, as well as has participated in various congresses and meetings national researchers and international. During the years 1990 and 1991 he served as the sociological profession in the businesses of Market Research and Public Opinion, Emopública (as Head of Studies) and Surveys (Senior Technician), where he conducted around a hundred studies in the various fields of inquiry and sociological (public administrations, conflicts, organizational, public opinion, social problems, studies, advertising, sociology, electoral, etc), using techniques of research, both quantitative and qualitative. He is presently the Director of the Spanish Journal of Sociology published by the Spanish Federation of Sociology (FES) and member of its executive committee.